Sun King / 3 Floyds Royal Brat | 3 Floyds Brewing Co.
Brace yourself for the extreme quaffability, severe mellowness, and aggressive tenderness in this loving embrace between two of Indiana’s most celebrated breweries. Brewers from Sun King and Three Floyds came together to produce this belligerently sessionable English-Style Best Bitter, brewed to celebrate the Sun King CANvitational. A: A finger and a half of off white head with larger bubbles was formed in an english pint glass. As it slowly receeded it left behind very little lacing but just a layer of small bubble foam on the top of the beer. The liquid is a mahogony, dark amber color with a small amount of haze. S: Sweet toffee and bread crust malts. There is an herbal hoppy character as well as some fruity yeast esters, but definatly malt dominent nose. T: A caramel, toffee, bread crust, biscuit malt profile that comes through very distinctly. There is an interesting mineral and husk like flavor coming through also. Earthy and herbal hop bitterness is firm, but the balance is on the malt side. The fruity yeast fermentation character is also noticable in the flavor. M: A low amount of carbonation combined with a medium body and low alcohol make this extremly sessionable. Pours a color resembling iced tea, which becomes a theme with this beer. It had a bright white frothy foam for a cap. The aroma is a bit twangy at first but settles nicely into a more malty scent. Caramel and toffee malts, minty tea leaves and a light apricot reaches the nose. The flavor is also malty but more of a tea leaf flavor. It actually tastes more like sweet iced tea as you drink it with a dark fruit, maybe raisin finish. The feel is very light and refreshing, almost watery, like iced tea. Good beer, especially if you enjoy the malt flavor that resembles the tea leaf, or should I say....iced tea. 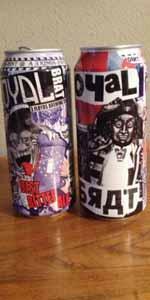 Sun King / 3 Floyds Royal Brat from 3 Floyds Brewing Co.